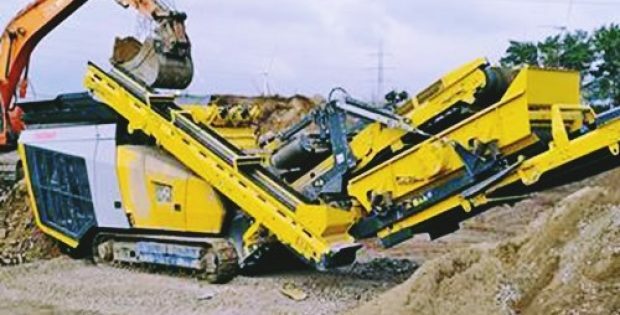 Keestrack, a manufacturers of mobile crushing plants, introduced its H4e mobile cone crusher at Hillhead 2018, an event attended by quarry operators and other users of heavy equipment across the globe. At the event, a fully hybrid version of the compact plant was displayed with optional integrated pre-screen and three deck hanging screen, assuring energy savings in secondary or tertiary productive crushing. According to an official statement, the range of machinery provided by Keestrack include over 20 different models for quarrying and recycling applications. Nearly every model is now made available in diesel-electric or full-electric options. Sources with the knowledge of the matter mentioned that the H4e is currently a unique market offering due to its optional three deck hanging screen. It’s weight reaches 46 tons when fully equipped, or 35 tons without optional equipment and allows for easy road transport with fast on-site relocation. Keestrack’s H4e also enables flexible autonomous operation, since its 462 HP onboard diesel engine drives a 330 kVa alternator that provides power to a 132kW crusher drive electric motor. The alternator is also necessary to power the 45kW pump unit for all hydraulic drives, including fans, screens, tracks and hydraulic cylinders. Sources claim that the setup supposedly enables fully plug-in operations through the mains or an external generator set, without the need for starting the diesel engine, saving up to 70% in energy costs. For minimizing the vibration and dust loads for the drive unit, the H4e diesel and alternator combination is available as a detachable option as well. The fully automated unit of H4e, featuring the KT-H4 cone crusher supplied by a leading global cone specialist, produces up to 250 tons per hour. During the secondary or tertiary production of highly defined end fractions, varied options of concaves allow flexibility in operations. Larger dimensions of the hanging screen and increased stockpiling capacity of its conveyors help H4e to avoid bottlenecks in the production process, claim reports.